The destruction caused by deforestation, wildfires and storms on our planet have been revealed in unprecedented detail. 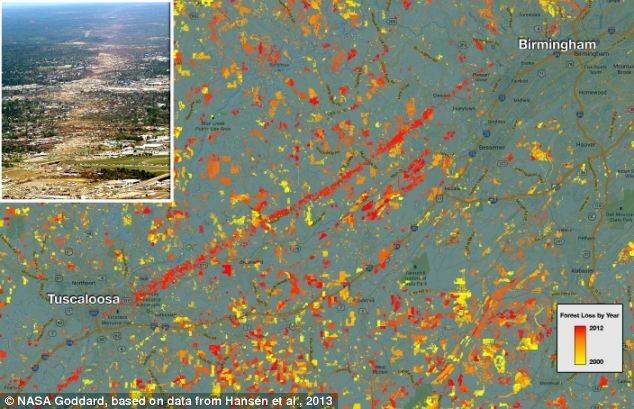 High-resolution maps released by Google show how global forests experienced an overall loss of 1.5 million sq km during 2000-2012. For comparison, that’s a loss of forested land equal in size to the entire state of Alaska. The maps, created by a team involving Nasa, Google and the University of Maryland researchers, used images from the Landsat satellite. Each pixel in a Landsat image showing an area about the size of a baseball diamond, providing enough data to zoom in on a local region. Before this, country-to-country comparisons of forestry data were not possible at this level of accuracy. ‘When you put together datasets that employ different methods and definitions, it’s hard to synthesise,’ said Matthew Hansen at the University of Maryland. The Brazilian government yesterday revealed that deforestation in the Amazon increased by nearly a third over the past year. Satellite data for the 12 months through the end of July showed that deforestation in the area climbed by 28 per cent compared with a year earlier. The total land cleared during the period amounted to 2,256 square miles (5,843 square km)- an area almost the size of Delaware. The figure fulfilled predictions by scientists and environmentalists, based on figures compiled through the year, that destruction was on the rise again. ‘You can’t argue with numbers,’ said Marcio Astrini, coordinator for the Amazon campaign at the Brazilian chapter of Greenpeace, the environmentalist group. ‘With Landsat, as a polar-orbiting instrument that takes the same quality pictures everywhere, we can apply the same algorithm to forests in the Amazon, in the Congo, in Indonesia, and so on. 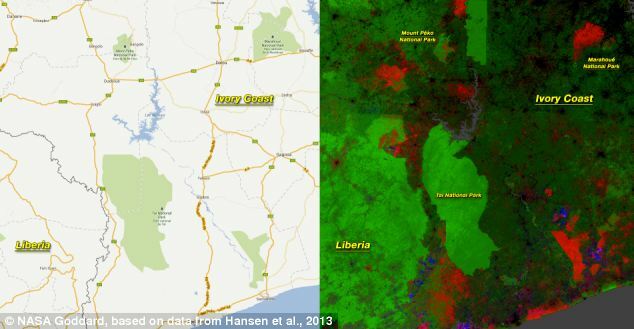 Professor Hansen looked at 143 billion pixels in 654,000 Landsat images to compile maps of forest loss and gain between 2000 and 2012. During that period, 888,000 square miles (2.3 million square kilometers) of forest were lost, and 309,000 square miles (800,000 square kilometers) regrew. The team found the deforestation rate in most countries increased. Indonesia’s deforestation rate doubled in the study period, from approximately 3,900 square miles (10,000 square kilometers) per year in 2000-2003 to more than 7,700 square miles (20,000 square kilometers) in 2011-2012. 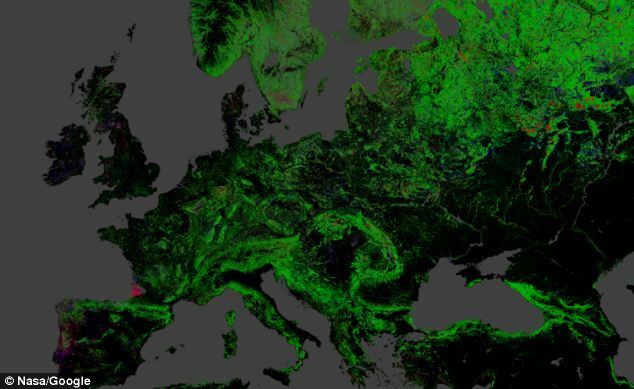 ‘This is the first time somebody has been able to do a wall-to-wall, global Landsat analysis of all the world’s forests – where they’re being cleared, where they’re regrowing, and where they’re subject to natural disturbances,’ said Jeff Masek, Landsat project scientist at the Goddard Space Flight Center. 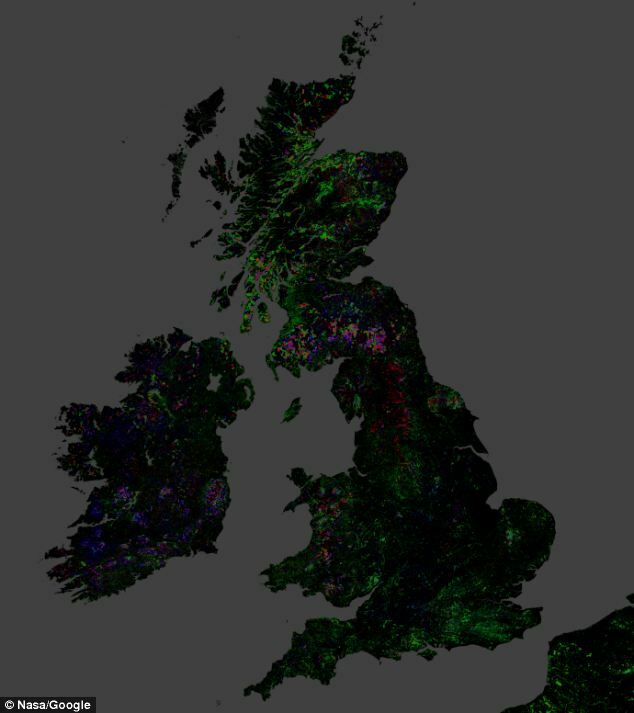 The maps also illustrate the impact of politics on land cover. For instance, on the island of Borneo, the maps clearly show the border between Malaysia and Indonesia. Malaysia’s heavy logging along forest roads is visible right up to the Indonesian border, where forests were still largely intact as of 2012. In Côte d’Ivoire, a civil war in 2002 corresponded with intense deforestation of several previously protected nature reserves. ‘Of this eco-region in the southeast, 30 per cent of the forest land was regrown or lost during this period,’ Professor Hansen said. 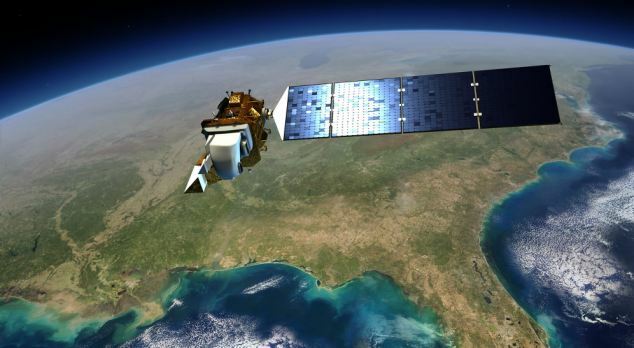 In Alabama, Landsat detected miles-long streaks of destroyed forest. When the researchers examined the year-by-year record, they found the damage occurred in 2011 after a violent tornado season. Brazil cut its deforestation rate from approximately 15,400 square miles (40,000 square kilometers) per year to approximately 7,700 square miles (20,000 square kilometers) per year. ‘That’s the result of a concerted policy effort to reduce deforestation, and it sets a standard for the rest of the world,’ Professor Hansen said. However, the Brazilian government yesterday revealed that deforestation in the Amazon increased by nearly a third over the past year. Although scattered, the total land cleared during the period amounted to 2,256 square miles (5,843 square km)- an area almost the size of the U.S. state of Delaware. The figure, fulfilled predictions by scientists and environmentalists, based on figures compiled through the year, that destruction was on the rise again.